August 17 , 2010 -- Despite the efforts of child safety advocates, 2010 could be the worst year ever for vehicle hyperthermia fatalities, according to Adjunct Professor of Geosciences Jan Null, who measures the rate that heat rises in the interior of parked cars and keeps statistics on hyperthermia deaths that occur as a result. Jan Null has found that the interior of a car can heat up almost 30 degrees in 20 minutes. Courtesy of General Motors. Null's records show that at least 26 people died from overheating while in parked cars during the first seven months of this year, making it the second worst year since 1998. Ten deaths occurred in the month of June alone. The former National Weather Service meteorologist began his research in 2002 when he was approached by journalists to comment on a story about an infant who had died of hyperthermia in a parked car. "I was really amazed at how fast the interior of a car can heat up," Null said. "Even in the shade, the interior of a car can rise as high as 19 degrees in just 10 minutes, and 45 to 50 degrees in one to two hours." According to Null, a parked car even in mild weather poses a danger to its occupants. Children are particularly vulnerable because their core temperature rises three to five times faster than an adult's. Organ failure and death can occur when the body temperature reaches 104 to 107 degrees Fahrenheit. 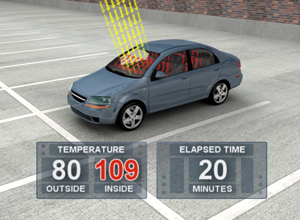 While the windows of a car are relatively transparent to the sun's shortwave radiation, this shortwave energy significantly heats the objects it strikes inside the car. Null says that a dark colored dashboard or seat can easily reach temperatures in the range of 180 to more than 200 degrees Fahrenheit in half an hour. Null's findings were first published in 2005 in a paper co-written with pediatricians in the journal Pediatrics. To date, nearly 500 children have died of hyperthermia after being left unattended in cars for as little as 30 minutes. The number of infant and toddler fatalities has increased steadily since airbags were installed in cars and child seats were placed in the back seat as a result. Many of these cases occurred when parents or other caregivers accidentally left a sleeping child in the back seat. Other cases involved children who got into unlocked cars or trunks and could not get out. Null said that more of these cases occur in mild, rather than hot weather, leading him to believe that people are vigilant in extreme weather but are more likely to forget in mild weather. American car manufacturers are evaluating technologies that would provide a warning to drivers about sleeping children being left behind, but Null is convinced that developing different habits can serve to remind anyone who is distracted or tired. "You can do something as simple as putting your purse, wallet or cell phone on the floor of the back seat as a reminder, he said. "Making a habit of placing a stuffed toy in the front seat when a child is in back can also serve as a visual reminder of the precious cargo in the back seat."